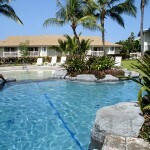 Alii Lani condominium in Kailua-Kona is a great place to live. It is conveniently located on Alii Drive, close to beaches and shopping. The complex features two- and three- bedroom floorplans and two swimming pools. Choose from level-entry first-floor units with outdoor courtyards, or second-floor units with vaulted ceilings and lanais. Perfect for full-time living, second homes, or rentals for 30 days or longer.